With apologies to Blackie Sherrod, we’re doing some scattershooting . . .
1. Whenever I hear or read about what a disastrous season the Edmonton Oilers are having, I think about the WHL’s website. 2. There apparently is no truth to the rumour that North Korean hackers are responsible for whatever it is that has happened to the WHL’s website. You have to like the moves Brent Sutter has made. 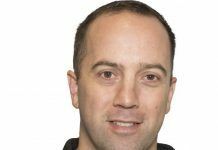 The Red Deer Rebels’ owner, general manager, head coach and chief bottle washer has a competitive team this season and, with the deals he has made to date, won’t have to sell his ranch to be competitive next season. The Rebels will be the host team for the 2015 Memorial Cup. 4. The Regina Pats are the second-best team that I have seen in person this season. What a stroke of genius it was to sign David Struch, who spent last season as the head coach of the Saskatoon Blades, as the lead assistant under John Paddock, who came in late and with limited knowledge of the league. 5. Do the Pats hang on to F Morgan Klimchuk, or do they move him at the deadline? That just might cause Paddock a sleepless night or two, but only if he gets a decent offer or two. 6. The conspiracy theorists would have us believe that the Kelowna Rockets conspired with the Edmonton Oilers to keep F Leon Draisaitl from playing for Germany at the World Junior Championship. You don’t really believe something like that could happen, do you? Do you? 7. Is there a chance that conditions for a Draisaitl deal were built into the earlier exchange that had D Josh Morrissey move from the Raiders to the Rockets? 8. The next time you watch an NHL or WHL game, count the number of cross-checking infractions that go uncalled. 9. The Everett Silvertips have started a stretch where they will play 12 of 14 games on the road. That includes a six-game East Division swing and two games in Prince George. Things may have gotten off to a rough start as two Everett defencemen left a Tuesday night game with undisclosed injuries. 10. If Kelowna does indeed end up with Draisaitl, perhaps the remainder of the season should be cancelled to allow the Rockets to rest up for the Memorial Cup. The Saga of Leon Draisaitl — surely it will become a Sportsnet made-for-TV movie — goes on and on and on. If you tuned in late, Draisaitl, a 19-year-old German, played the last two seasons with the WHL’s Prince Albert. The Edmonton Oilers selected him with the third overall pick of the NHL’s 2014 draft and he now is on their roster. 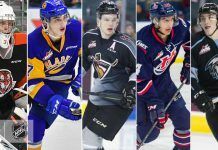 But there is rampant speculation that the Oilers are about to return him to the WHL and that his rights already have been dealt to the Kelowna Rockets. If that’s the case, why hasn’t a trade been announced? In order to add Draisaitl, the Rockets would have to drop one of their two imports. Presumably, they would include Swiss F Kris Schmidli in a trade for Draisaitl. 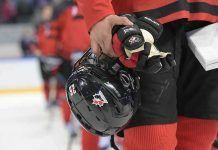 Schmidli is playing for Switzerland at the World Junior Championship and the Canadian Hockey League maintains a trade moratorium on any players in the WJC until the tournament is over. Interestingly, the conspiracy theorists are also in evidence on this one. Bruce Hamilton, the president and general manager of the Rockets, also is a member of the Hockey Canada management committee that oversees its Program of Excellence, including the national junior team. Hamilton also is tight with the Oilers’ management group. This Draisaitl deal was rumoured before WJHC roster cut off date.. I’m sure it was a stipulation that he wasn’t playing in tourney.. Strictly because the Rockets who acquired him have strong Team Canada ties, and I doubt there is anything Germany could do. Mark Spector of Sportsnet has more on the Draisaitl story right here, including an explanation as to why something is likely to happen this weekend. Last night, Draisaitl played 12 minutes one second in the Oilers’ 3-2 shootout victory over the visiting Los Angeles Kings. He was pointless, with one shot on goal and two penalty minutes. . . . He has two goals and five assists, and is minus-18, in 36 games. A reminder: If you’re a WHL fan and you’re on Twitter, make sure you are following WHL Facts (@WHLFacts). He’s got all the numbers. Elliotte Friedman of Sportsnet has the latest edition of 30 Thoughts and it’s right here. In Brandon, F Tim McGauley’s 24th goal of the season stood up as the winner as the Wheat Kings beat the Prince Albert Raiders, 4-1. . . . The Wheat Kings took a 3-0 lead into the second period. . . . McGauley also had an assist. . . . Brandon D Ryan Pilon drew two assists. . . . Brandon G Jordan Papirny stopped 31 shots. . . . Raiders F Jayden Hart scored his 19th goal at 8:03 of the second period, on a PP. . . . Prince Albert took 61 of the game’s 120 penalty minutes. . . . The Wheat Kings continue to be without F Jesse Gabrielle (ill), who hasn’t played since before the Christmas break. . . . The Raiders lost D Craig Leverton early in the second period and he didn’t return. . . . Brandon (27-7-4) is 6-0-2 in its last eight games. . . . The Raiders (16-21-1) have lost three in a row. . . . In Saskatoon, the Regina Pats scored the game’s last four goals and beat the Blades, 5-3. . . . Pats F Morgan Klimchuk accounted for the game’s last three goals, scoring three times in four minutes 30 seconds. He’s got 13 goals. . . . F Adam Brooks assisted on all three, while F Braden Christoffer was in on two of them. . . . Klimchuk tied the game at 10:56 of the third period, got the winner at 11:27 and added insurance at 15:26. . . . F Connor Gay scored his side’s first two goals, givin ghim 18. . . . F Cameron Hebig gave the Blades a 3-1 lead at 1:28 of the third period, on a PP. He’s got eight goals. . . . The Pats (22-12-2) have won two in a row. . . . 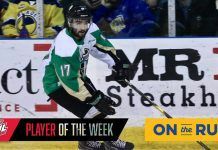 The Blades (9-26-3) had won their previous two games. . . . Regina lost D Austin Wagner and F Sam Steel to undisclosed injuries during the game. . . . Daniel Nugent-Bowman of the Saskatoon StarPhoenix has a game story right here. . . . The Wheat Kings visit Saskatoon for the WHL’s only New Year’s Day game. . . . The Pats are in Moose Jaw tonight for a New Year’s Eve party with the Warriors. . . . In Red Deer, F Glenn Gawdin and F Jake DeBrusk scored the only goals of the shootout to give the Swift Current Broncos a 4-3 victory over the Rebels. . . . The Broncos never once held a lead until the game-winning goal. . . . DeBrusk scored twice in regulation time, giving him 20. . . . D Max Lajoie had two assists for the Broncos. . . . F Conner Bleackley scored his 18th goal to give the Rebels a 3-2 lead at 14:19 of the third period. Broncos D Brett Lernout tied it with his ninth goal at 19:08. . . . F Riley Sheen scored twice for Red Deer, giving him eight. . . . Bleackley also had two assists. . . . Broncos G Landon Bow stopped 35 shots. . . . The game was played on the 28th anniversary of a bus accident that claimed the lives of four Broncos — Trent Kresse, Scott Kruger, Chris Mantyka and Brent Ruff. The Broncos were on their way to Regina for a game with the Pats at the time. . . . The Broncos improved to 19-15-4. . . . The Rebels (20-13-5) had won their previous two games. . . . The Broncos were without F Carter Rigby, who served Game 1 of a two-game suspension for a checking-from-behind penalty he took on Sunday in Regina. . . . Rigby hit Regina D Chase Harrison, who was a scratch from the Pats’ lineup last night. He has a concussion. . . . The Broncos play in Edmonton tonight. . . . In Calgary, F Pavel Karnaukhov scored three times and F Connor Rankin had five points as the Hitmen dumped the Lethbridge Hurricanes, 9-2. . . . Karnaukhov, who also had an assist, has 15 goals. He scored once in each period. . . . Rankin scored two goals, giving him 17, and added three assists. . . . The Hitmen took a 7-2 lead into the third period. . . . F Adam Tambellini scored his 22nd goal for Calgary. . . . 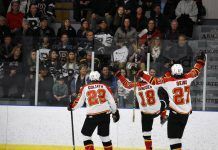 The Hitmen (20-14-3) snapped a three-game losing streak and stayed two points ahead of fourth-place Kootenay in the Central Division. . . . The Hurricanes (9-22-5) have lost their last two. . . . In Medicine Hat, the Tigers got shootout goals from F Cole Sanford and F Trevor Cox to bat the Kootenay Ice, 5-4. . . . F Luke Philp had two goals and two assists for the Ice. His 17th goal of the season, at 17:12 of the second period, gave his side a 4-3 lead. . . . Tigers D Matt Staples scored his first goal at 10:01 of the third period to force OT. . . . After Sanford scored in the shootout, F Tim Bozon equalized for the Ice. 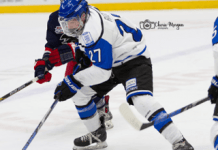 Cox then scored what proved to be the winner once Philp was stymied. . . . F Jaedon Descheneau scored his 20th goal and added three assists for Kootenay. . . . D Kyle Becker scored twice for the Tigers, giving him 10. . . . Sanford scored his 30th goal, while Cox had two assists. . . . Ice G Wyatt Hoflin set a franchise record with his 26th straight appearance. He stopped 26 shots. . . . Tigers G Marek Langhamer turned aside 37 shots. Descheneau was unable to beat him on a penalty shot at 15:37 of the third period. . . . Among the Tigers’ scratches were F Steve Owre and F Chad Butcher. . . . The Tigers (26-9-2) have won two in a row. . . . The Ice (20-17-1) had won five straight. . . . Taylor Rocca of the Cranbrook Daily Townsman has more right here. . . . In Vancouver, F Jesse Roach doubled his goal total as he scored twice in the Giants’ 6-3 victory over the Kamloops Blazers. . . . Kamloops D Ryan Rehill scored his fourth goal at 1:19 of the first period. . . . Vancouver scored the game’s next five goals, including two from Roach, who now has four. . . . Vancouver D Arvin Atwal scored his fourth goal and added two assists. . . . The Blazers got two assists from each of F Matt Needham and F Cole Ully. . . . Kamloops D Dawson Davidson, the pride of Moosomin, Sask., scored his first WHL goal. The Blazers brought him in for a look-see from the midget AAA Moose Jaw Generals. . . . Vancouver F Dalton Sward came up short on a third-period penalty shot. . . . Vancouver G Cody Porter stopped 32 shots, five more than Kamloops’ Connor Ingram. . . . The Giants improved to 17-19-1 and now are 8-3-1 since making a coaching change. They are fourth in the B.C. Division, but just four points out of second. . . . The Blazers (13-22-5) have lost four straight. 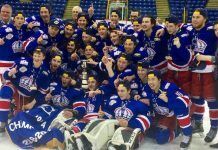 They went 2-9-0 in December, finishing up with eight straight road games. . . . Jon Keen, the radio voice of the Blazers, tweeted before the game that Kamloops was 17-49-6 in 2014. That means this was the Blazers’ 50th loss of the calendar year. . . . In Kent, Wash., F Keegan Kolesar scored two goals and set up another as the host Seattle Thunderbirds beat the Everett Silvertips, 4-2. . . . Kolesar has 13 goals. . . . He broke a 1-1 tie at 7L32 of the second period on a PP and added insurance at 1:36 of the third. . . . Seattle D Ethan Bear scored his ninth goal and added two assists, while F Justin Hickman had two assists. . . . F Nikita Scherbak scored his 18th goal on a third-period PP for Everett. . . . Seattle G Danny Mumaugh stopped 28 shots. . . . Everett lost D Kevin Davis and D Tristen Pfeifer to undisclosed injuries in the second period. . . . Everett is early in a stretch where it will play 12 of 14 games on the road. That includes a six-game East Division swing and two games in Prince George. . . . Attendance was 6,219, a season-high for Seattle. According to TBird Tidbits (@TBirdTidbits), that is the largest crowd for a Seattle home game since Feb. 23, 2008, when 8,369 fans watched Portland and the Thunderbirds play at KeyArena. . . . The Thunderbirds (17-15-4) have won four in a row. . . . Everett (21-11-4) has lost two straight. . . . The Thunderbirds are in Portland tonight for the Winterhawks’ annual New Year’s Eve bash. . . . In Kelowna, G Ty Edmonds stopped 45 shots to lead the Prince George Cougars to a 5-3 victory over the Rockets. . . . Kelowna held a 21-3 edge in shots in the first period but trailed 2-1. . . . F Chase Witala and F Jared Bethune each had a goal and two assists for the Cougars, while D Tate Olson had two assists. . . . Witala has 18 goals; Bethune has five. . . . After Bethune and F Chance Braid, with his eighth, gave the visitors a 2-0 lead, the Rockets were never able to equalize. . . . F Rourke Chartier scored his WHL-leading 35th goal at 19:26 of the third period, on a PP. . . . Kelowna G Jackson Whistle left at 4:52 of the second period, having allowed three goals on six shots. . . . D Riley Stadel and F Justin Kirkland each had a goal and two assists for the Rockets. Stadel has seven goals; Kirkland has 13. . . . The Cougars are 19-19-0. . . . The Rockets (29-6-3) had won three in a row.